Ridler, Jason. "Treaty of Ghent". The Canadian Encyclopedia, 21 March 2018, Historica Canada. https://www.thecanadianencyclopedia.ca/en/article/treaty-of-ghent. Accessed 22 April 2019. A Hundred Years of Peace. 1914, by A. Forestier. The Signature of the Treaty of Ghent between Great Britain and the United States of America, Dec. 24th 1814. 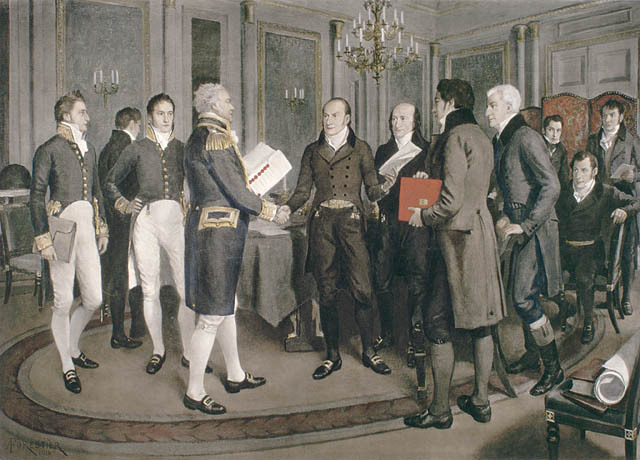 Treaty of Ghent, signed in Ghent, Belgium, on Christmas Eve 1814 by Great Britain and the US to end the War of 1812. Negotiations for peace had begun the previous year, with both parties agreeing to meet in Europe to work out the details. The military situation in North America was so balanced that neither side had achieved its war aims. For the British, it had been a war of survival for their remaining territories in North America, and thus their diplomats remained on the defensive. With the abdication of Napoleon Bonaparte, most of Britain's great diplomats were tasked with the difficulties of settling with France for over a decade of warfare, and the delegation at Ghent was not very strong. It consisted of Admiral Gambier, Henry Goulburn (Parliamentary Undersecretary for War and the Colonies), and William Adams, a Doctor of Civil Law. The Americans included firmer talent such as John Quincy Adams, James A. Bayard, and Albert Gallatin. The two delegations met in the neutral state of Belgium in August 1814. Britain's initial instructions were to be forceful, with some in London hoping that the release of their armies from fighting in Europe might effectively change the seesaw battles of 1813 toward British victory. But ten years of constant warfare made most diplomats eager for peace and avoiding the impression that London was now on a war of conquest. The capture of Washington in September and incursion into Maine turned the US delegation sullen until the news of American victory at Lake Champlain. Even in the midst of diplomacy, the relative deadlock of the battlefields continued. Fear of a revived French army led London to ask their champion soldier the Duke of Wellington, currently the ambassador in Paris, to consider leading the forces in North America. The Duke was clear that he did not think even he could make good on the situation in the New World, and London turned its attention to a quick peace. Washington informed their delegation that a return to the status quo ante bellum was desired, due to the worsening economic and trade situation created by the war. They drafted a treaty of 15 initial points, to which the British agreed to nine, and two more were added. The final 11 articles became the Treaty of Ghent before Christmas Day 1814. All conquests were to be returned. Hostilities against the First Nations were to be terminated by both sides, and Britain was not to arm the Aboriginals for operations against the US. Consequently, none of the issues that had caused the war or that had become critical to the conflict were included in the treaty. There was nothing included on neutral rights or impressment. All captured territory in Upper and Lower Canada and the US was returned to its original owner. Outstanding concerns about the western boundaries of both countries were resolved later by a commission. War prisoners were to be returned to their home countries. The British proposal to create a buffer state for the Native Americans in Ohio and Michigan fell apart after the dissolution of the Native coalition. But news was slow to travel from Europe to North America, and operations already begun played out as news of the Treaty made its way to both British and American forces. The American victory at New Orleans, under the command of future US president Andrew Jackson, took place two weeks after the signing; a month later, the British achieved one last land victory at the Battle of Fort Bowyer, under Major General John Lambert. But with the war over, both London and Washington were to settle their differences peacefully. What emerged from this peace was the survival of Upper and Lower Canada as part of British North America, and with it a growing sense of identity different from that of their American neighbours and, indeed, the Imperial motherland. Washington had hoped that the once-American populations of Upper and Lower Canada would rise up and side with the invading forces, a hope that was never realized. For the Canadas, the war also bred the infamous "militia myth," that the chief battles had been won by and large by part-time citizen soldiers, which thus negated the need for the colonies to invest in professional soldiers. This myth, which downplayed the incredible influence of career soldiers like Isaac Brock and First Nation chiefs like Tecumseh, would continue to influence military affairs in Canada until the First World War.